The Art Journey challenge is asking for black and white projects. I love colour, so this has felt quite difficult! 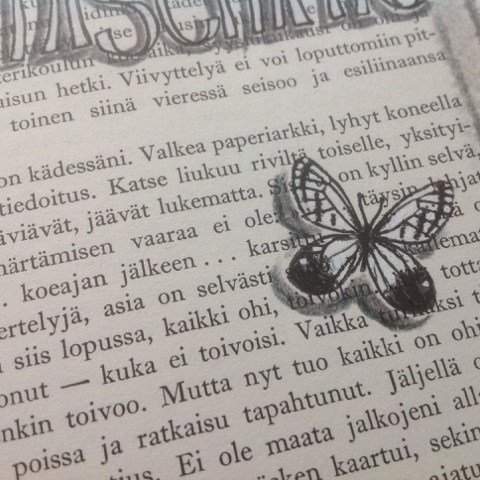 Anyway, looking for inspiration, I took an altered book from the shelf... haven't been adding anything for a while, but I found a page with text already written, and realized I could add some stamping and finish the spread. I am also posting for the Paperilla challenge (Letters). 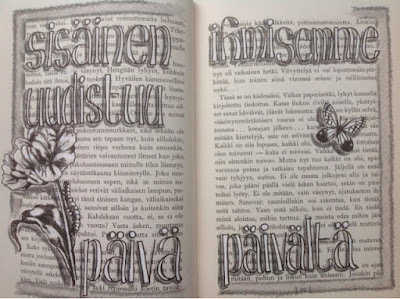 The text says "our inner self is renewed day by day", and I feel butterflies are a good symbol of growth and new beginnings. I have added white Sharpie to the text and images to block out the background text, and used colour pencils in grey and black to add shadows that create depth and make the images pop from the background. The stamps are from the lovely Tulip set from Art Journey. Beautiful entrie, thanks for joining our challenge!! Love your work, thanks for joining our challenge!